15 Seconds ADB Installer v1.4.3 is a small application for windows computer created by Snoop05 (xda developer), which allows you to install the latest android USB driver on windows computer. It also allows you to fix ADB not recognized and device not found errors. It contains the ADB, Fastboot and the latest android drivers. ADB or Android Debug Bridge lets you manage your android device from your computer. Whereas Fastboot works in bootloader mode and allows you to re-flash system partitions on android devices. Both ADB and Fastboot are used to send terminal commands to an android device from a command line on computer. 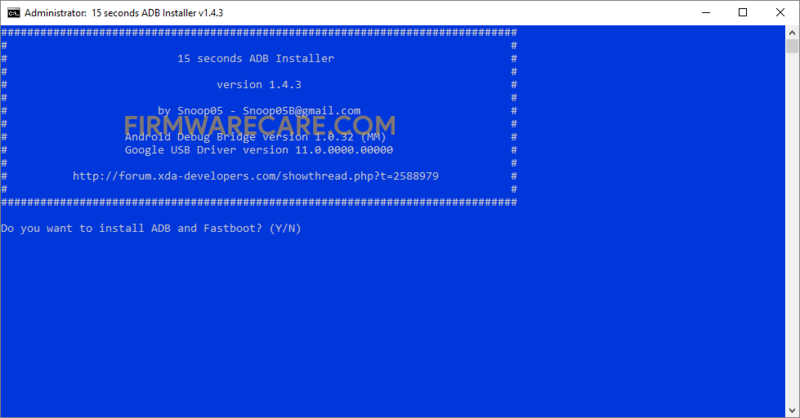 As the name suggests, 15 Seconds ADB Installer v1.4.3 allows you to install android drivers in less than 15 seconds with its simple and easy to use interface. In order to use the 15 Seconds ADB Installer, you need to install the Universal ADB Driver on your computer. [*] Compatibility: The 15 Seconds ADB Installer runs perfectly on Windows XP, Windows Vista, Windows 7, Windows 8, Windows 8.1 and Windows 10 (32 bit and 64 bit). [*] Credits: 15 Seconds ADB Installer is created and distributed by Snoop05 (xda developer). So, full credits goes to Snoop05 (xda developer) for sharing the tool for free.